An expert in Advanced Management of Sales Teams, the professional career of the Professor Rafael Díaz Cruz has developed in the area of marketing and sales in environments B2B with special attention to industrial sectors. 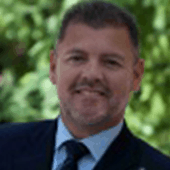 Professionally, during the last 20 years he has occupied several positions in companies such as Schindler where he was successively Project Manager, Business Unit Manager and National Sales Manager and in Besam Ibérica where he was Sales & Marketing Director for Spain and Portugal. Since 2002 he is Sales & Marketing Vice-president in Terratest Group, Spanish multinational leader in special foundations industry and environment. From this position he is in charge of the sales and marketing operations of Terratest Group. Professor Díaz Cruz has a Master in Business Administration by IESE, Master in Marketing Management by Esden and a Bachelor’s Degree in Industrial Engineering. He is currently an Adjunct Marketing Professor at IE Business School, Visiting Professor at ESERP Business School and a regular speaker in several forums. • Bachelor of Business Management and Administration. Staffordshire University. U.K.